"Last night, I bedded a demon to whom I meant to sell my soul... which still leaves me more adherent than most Catholics I know." 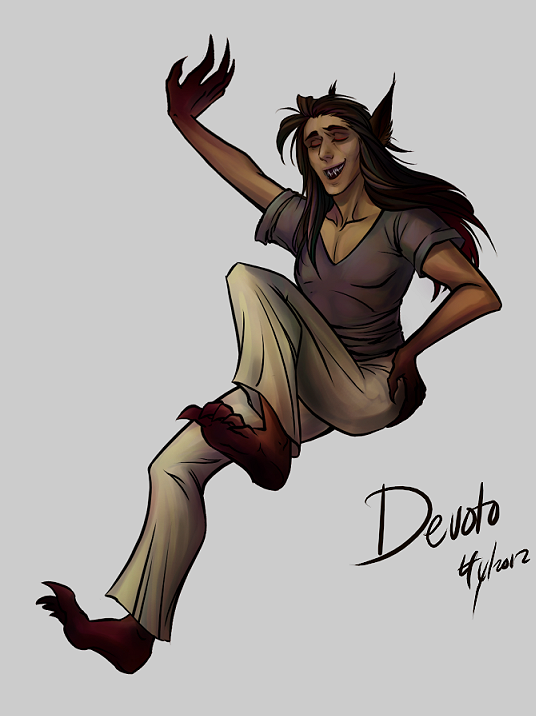 "Devoto: Music in Hell" is a m/m webcomic about the demon (read: fallen angel) of music, who is trapped in Hell. His only escape is when a human summons him to Earth in order to make a deal with him. Devoto's goal is to get out of Hell as long as possible. Devoto has not been out of Hell in a long, long time. It's a gorgeous webcomic with stunning artwork and heartfelt dialogue. It follows the story of not only Devoto and his mortal lover, but also Isam and Zima, two angels - one fallen and one not - in love, kept apart by Heaven and Hell. Despite the obvious talent of the artist, I don't think this webcomic is as well-known as it should be. So click on it! It's great! Give the creator some love! I may as well call this "Gay Webcomics Blog" from now on.